Paws Vegas is a Las Vegas themed night benefitting the animals of Paws and Prayers Pet Rescue! 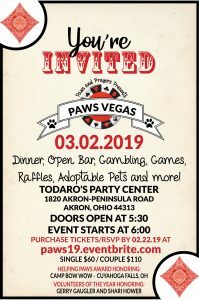 Enjoy a night of food, open bar, raffles, silent auction, adoptable pets, and best of all – Vegas style games! Paws and Prayers saves 1,000 animals each year. This event helps us be able to continue to carry out our mission and keep saving pets. We will be honoring Camp Bow Wow Cuyahoga Falls with the Helping Paws and Award and Volunteers of the Year, Gerry Gaugler and Shari Hower.